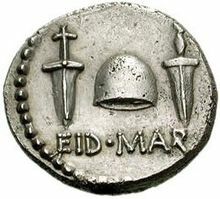 The pileus (Greek: πῖλος – pilos, also pilleus or pilleum in Latin) was a brimless, felt cap worn in Illyria and surrounding regions, later also introduced in Ancient Rome. The Greek πιλίδιον (pilidion) and Latin pilleolus were smaller versions, similar to a skullcap. 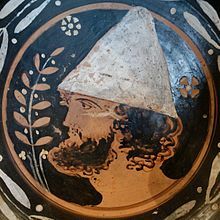 The pilos (Greek: πῖλος, felt) was a common conical travelling hat in Illyria and Ancient Greece always used by Illyrians and Epirotes tribes in Greece. The pilos is the brimless version of the petasos. It could be made of felt or leather. Pilos caps often identify the mythical twins, or Dioscuri, Castor and Pollux, as represented in sculptures, bas-reliefs and on ancient ceramics. Their caps were supposedly the remnants of the egg from which they hatched. The pilos appears on votive figurines of boys at the sanctuary of the Cabeiri at Thebes, the Cabeirion. The pilos helmet was made of bronze in the same shape as the pilos which was presumably sometimes worn under the helmet for comfort, giving rise to the helmet's conical shape. The first widespread adoption of the pilos helmet occurred in Sparta towards the end of the 5th century BC.. Pileus (Plis) is worn even today in countries such as Kosovo and Albania. Chisholm, Hugh, ed. (1911). "Costume" . Encyclopædia Britannica. 7 (11th ed.). Cambridge University Press. p. 232. Chisholm, Hugh, ed. (1911). "Biretta" . Encyclopædia Britannica. 3 (11th ed.). Cambridge University Press. p. 980. "similar to the pileus or pileolus (skull-cap)"